Grape Seed Antioxidant / 90 Veg Caps Double Strength 100 mg - Nature's Way®. Why take Grape Seed Phytosome™ 100 mg? Our process combines one part standardized grape seed extract (a water-soluble component) with 2 parts phosphatidylcholine (fat-soluble molecules), helping it be absorbed and better used by your body. 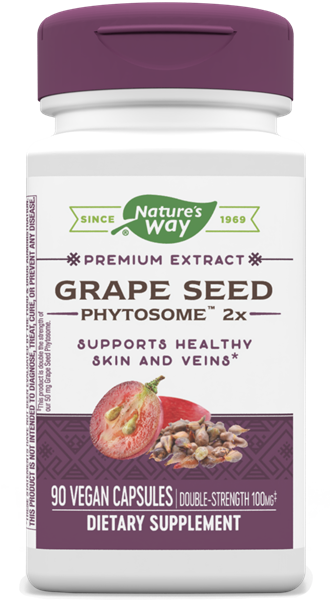 * This grape seed supplement really delivers its benefits, at twice the strength of our standard Grape Seed Phytosome. Take 1 capsule three times daily. If pregnant, nursing, have a clotting disorder or taking any medications, consult a healthcare professional before use. ‡This product is double the strength of our 50 mg Grape Seed Phytosome.